With the Directferries.ie Ferries to Ishigaki Island guide get all the information you need to plan and book your ferry crossing. 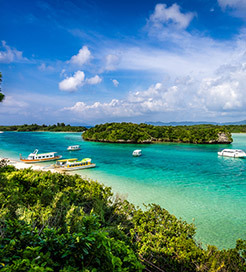 We currently offer ferries to Ishigaki Island on around 6 ferry routes with a choice of up to 580 sailings weekly. To get a ferry price and to check availability for ferries to Ishigaki Island, please select your place of departure from the menu to the left and hit search! For more information, please visit our Ferries from Iriomote Island to Ishigaki Island page. For more information, please visit our Ferries from Hatoma Island to Ishigaki Island page. For more information, please visit our Ferries from Kohama Island to Ishigaki Island page. For more information, please visit our Ferries from Kuroshima Island to Ishigaki Island page. For more information, please visit our Ferries from Taketomi Island to Ishigaki Island page.